If there a key to smaller home living, its finding enough storage space to keep things neat and uncluttered. 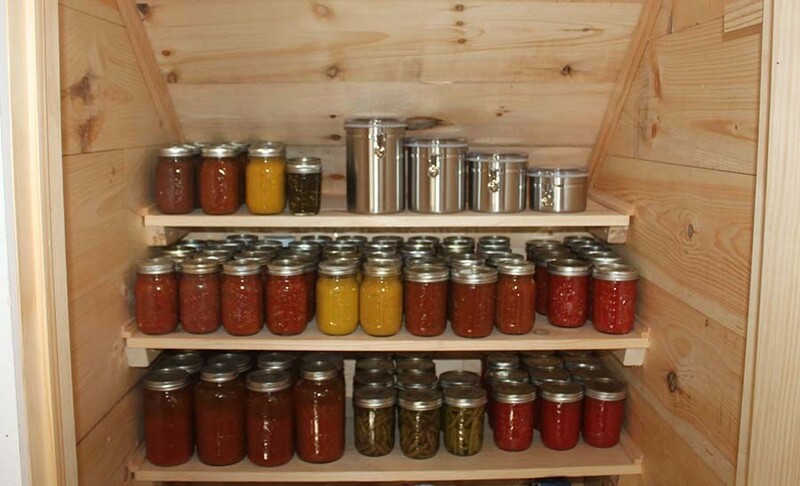 When we decided to downsize to a floor plan of just over 1000 square feet at the farm, we knew we would have to come up with a few creative solutions for storage. But whether it’s food, blankets, winter jackets or family albums, every household still ends up with a need for storage space. For us, that meant finding some unique solutions in a home with such a small footprint. Of all of the space-saving features in the house, I think the dual use of the staircase space underneath the loft is our favorite. The staircase in our main living area is made up of two sections. A small section of 3 steps that lead to a landing area, and a second larger set heading right to the loft. That L configuration helped us save a lot of floor space in the main room. More importantly, it gave us the opportunity for a pantry and a bedroom dresser! Underneath the large bank of steps, we created a built-in set of pantry shelves to hold all of our canning jars and dry goods. The area is directly beside the kitchen, making it perfect for a pantry. Once the shelves were completed, we added a door to close it off and complete the look. It gives us about 30 square feet of storage space on the shelves. That left the area on the landing as the only space unused under the steps. By design, it backs up against the master bedroom, making it perfect for built-in drawers. Although not high enough for shelf storage, it is perfect for deep dresser drawers. This week’s project is to install 4 large homemade dresser drawers to fit right into the openings we left in the wall. Each drawer will measure 30″ long x 24″ deep x 15 wide”. They will rest on roller glides between each stud in the wall to slide out easily. In a space that would otherwise be wasted, we can store a multitude of jeans, t-shirts and more. One of our biggest concerns was where to store stock pots, pans and larger items like crockpots and blenders. We knew those bigger items would quickly fill the limited cabinet space we had. The kitchen island has plenty of space inside to hold all of our large pots and pans. And BTW – thankfully – our countertops get installed this week. It has been a treat living with particle board tops! The answer was a DIY kitchen island. We opted to build our own island and keep it wide open inside with four large shelves on the backside. The result is four huge storage shelves that measure 15″ high x 32″ deep and 40″ wide. This project is still to come, and high on our priority list now that we have moved in! 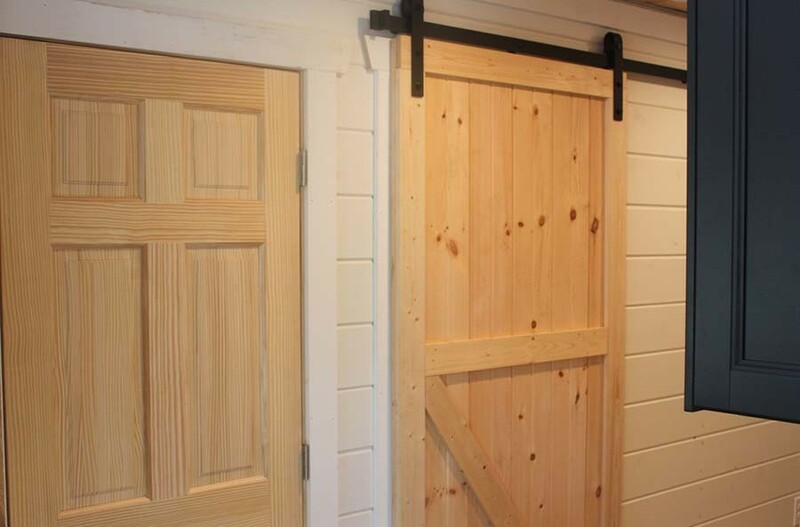 We will be using the left side of the loft to create a 12′ long x 5′ deep x 72″ high knee-wall storage space. 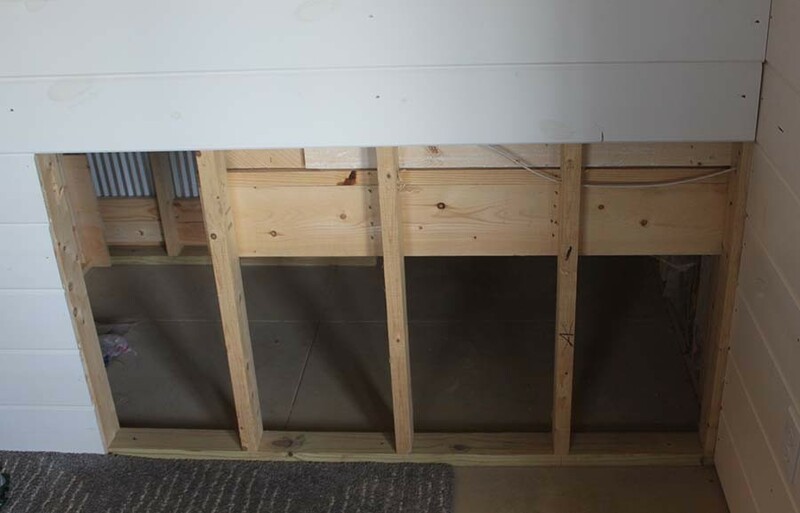 The loft area above the kitchen will be home to a built-in knee wall storage area. 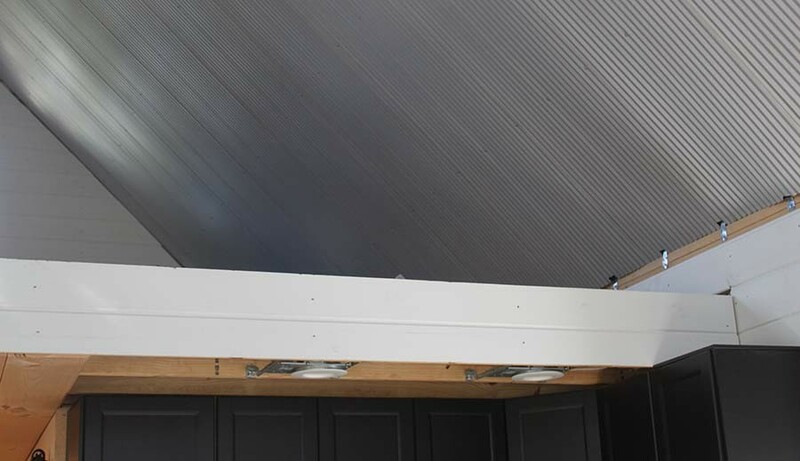 Knee-walls are a great way to take advantage of space that is otherwise lost by a sloping roof line. With the depth, we can even include a long pole for hanging winter clothes, jackets and other seasonal items. 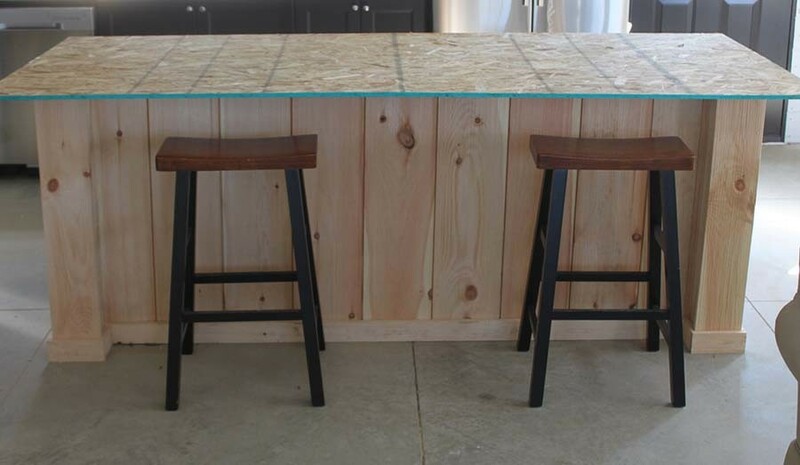 We will be sure to feature the knee wall build in one of our DIY articles in the near future. One thing is for sure, it has been a wonderful experience to have simplified our life with a smaller house and less “stuff.” And by using a little imagination, we have found more than enough storage space in our home to store the necessities of life. Here’s to Simple Living! – Jim and Mary. To receive our Recipes, DIY and Gardening articles each week, sign up to follow the blog via email in the right hand column above, “Like” us on Facebook, or follow us on Twitter. You can also check out our new book, Growing Simple,now available on Amazon.com. ← How To Use Autumn’s Falling Leaves To Power Next Year’s Garden! I really need some details on your “shiplap vs Sheetrock” installation!! I live in WA state and am building my homestead, beginning w the garage. Sheetrock has never been my favorite, so I seized on your idea & have read your posts multiple times on a he subject. Unfortunately, I’m having trouble finding shiplap that is cost effective/less expensive than Sheetrock. Could you contact me w specifics on what you used and where you sourced it? Have been following you & love your progress & methods! Great ideas, and also at the ends of your kitchen island, you could have also made those bump out area into shelves for cookbooks, or other items.